Wine Tastings can be enjoyed in a number of ways; from informal tastings at home to formal black tie affairs. All are fun as long as you take pleasure in tasting the wine. Various types of tastings include visiting the tasting room at a vineyard, having a wine consultant visit your home, an open tasting at a wine shop, at charity events, and private tastings in homes. The private tastings in homes are our favorites. Open or blind tastings are always fun, although the mystery of blind tastings adds a bit of excitement (we tend to like these the best). These parties are excellent opportunities to learn about new wines, and what foods are great with them. There really are no set ‘rules’ for tastings, but things may flow better if a few guidelines are covered. Keep the guest list to 6 – 12 people. You can do it with more, but a lot of the focus on the tasting gets lost. Have each guest bring a bottle of wine. If there will be more than 8 to 10 tasters, it is better to double up on the wines. In most cases, by the time you’ve tasted your 14th wine, there’s not a whole lot of sensitivity left in the ole taste buds. If mostly couples are invited, have them bring 2 bottles of the same kind. This will allow everybody a chance to try the wine a second time. Eight or less, go with a bottle per person. That will give you a good variety to try. Be prepared with enough glassware. And supply ‘dump buckets’ and water for rinsing the glasses. It is always good to provide water for drinking too. Never hurts to keep hydrated. 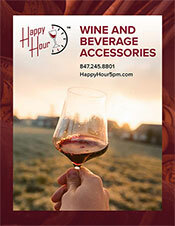 Use Happy Hour wine charms or wine glass tags so everybody knows whose glass is whose. Turn on some background music. Not too loud though, you want to encourage conversation and debate about the wines. Have enough seating for everyone, even if many of the people prefer to stand or walk around. Avoid using strong deodorizers or candles. This includes perfumes and colognes. The fragrances of these can take away from the bouquet of the wines. What kind of Wine? Since there are no rules, you could have your guests bring anything they want. You can have all reds, all whites, or both. If offering both, serve the whites first. It often works better if wine from a certain country, varietal, or region is selected. For example, the wine theme could be; anything from Australia…Chateuxneuf du Pape’s from France…or as detailed as choosing Cabernet Sauvignons from the Howell Mountain Appellation of Napa Valley, 2004 vintages. However, being too specific does not always work out great. Foods that compliment the wines are best to serve. Many times a selection of appetizers is perfect. Serving a full dinner often takes too much of the host’s attention, keeping it off of the wine. And, as with most parties, there are plenty of appetizers to satisfy everyone’s need to eat. Always have bread and crackers available. Also, since you will probably serve a variety of wines, appetizers allow the guests to eat smaller amounts so they can continue to eat as they sample the wine. Serving the Wine. In an open tasting, serve from lightest to darkest. Match the food servings with the various wines. Try lighter or more elegant foods with the lighter wines. Save the red meat appetizers, pastas, strong cheeses and chocolates for the full bodied wines. But as mentioned above, we like blind tastings the best. In a blind tasting, have your guests keep their choices a secret. Ask them to bring the bottles in plain brown paper bags. The host can then transfer them into specially made wine tasting bags, or simply mix up the bottles and then mark each with a number (starting with 1). Make sure all tasters have paper for notes and something to right with. Start by pouring bottle #1, having everyone evaluate each different wine as they taste it. You can have them rate the wines overall, or get more complicated and rate the Appearance, Aroma, Taste and Aftertaste, as well as their overall impression. See if anyone can pick out what they are tasting. Challenge them to guess correctly. Seeing/Sight – Hold the glass up to a light and look at the clarity of the wine. Swirl – Swirling the wine brings out the bouquet. Smell – Stick your nose in the glass and sniff the bouquet. Sip – Make sure you coat your taste buds with the wine. Savor/Swallow – See if the flavor changes at the finish. When all of the wines have been tasted, have each person pick out their 3 favorites. Offer a short second taste in case anyone is still deciding. Tally up the votes and announce which bottle number came in first, second and third. Then remove the bottles form the bags to reveal the winners. Be sure to make the label with the appropriate number so everyone will remember which is which. After the person that brought the winning bottle is finished telling the story about why they chose that particular variety, let everyone take more of whatever they want to try again. Make sure they keep working on the food too! One more thing....don't worry about everything being perfect...relax and enjoy. People have different tastes in wine, they’ll have different opinions about it.